To hear the professional left’s “culture commandos” tell it, revered conservative author, commentator, and documentary filmmaker Dinesh D’Souza is a criminal – and stark, raving mad. A search for D’Souza online, and will quickly show that he’s a “convicted felon.” His Wikipedia page, for instance, references him as an “Indian American political commentator, convicted felon and author” (emphasis added) – making sure his brush with the law is listed ahead of his status as a best-selling writer, and well ahead of his status as the most successful conservative documentary filmmaker of all time. If one searches for recent news about D’Souza, one will find that a federal judge recently ordered him to undergo ongoing psychiatric treatment as a condition of his probation. “Mr. D’Souza has weaknesses in controlling his own impulses and … is prone to anger in reaction to criticism,” the judge stated. Really? Or was he too successful in criticizing Barack Obama? Navigating the fine print, one eventually learns that D’Souza’s “crime” involved relatively minor campaign finance infractions committed on behalf of his friend Wendy Long during her 2012 U.S. Senate race. Dig deeper, and it becomes readily apparent that D’Souza isn’t mentally ill – far from it. Rather, he’s the latest victim of America’s “culture war” – an attempt to radically remake this nation in the image of Soviet Russia. The tarring and feathering of D’Souza is but one high-profile example of a pervasive, anti-American assault on core conservative, constitutional values – and those who dare to advance them. It is no longer merely “government overreach,” “liberal bias in the media,” or “political correctness run amok.” It is something more sinister: an increasingly brazen totalitarian effort to remake American democracy in the image of statist, conformist, command-economy orthodoxy. This “vast left-wing conspiracy” leverages regulatory edicts, PC “teachable moments,” and crony capitalist financial pressures to suppress the ideals and ideologies that once made our nation the envy of the civilized world. Its objectives? Compulsory tolerance, selective justice, the perpetual subsidization of our dependency culture, open borders, a disarmed populace, vaporized property rights, warrantless mass surveillance, the ceding of popular authority to the state (and American sovereignty to the world), the deification of progressive leaders, mass youth indoctrination via government-subsidized revisionist history, the debasing of religious freedom, the erosion of the U.S. Constitution, and the relegation of our nation’s two founding pillars – freedom and free markets – to the dustbin of history. Think that’s hyperbolic? Consider retired liberal general Wesley Clark – the former supreme NATO commander in Europe – who last month said American citizens who disagreed with their government should be sent to internment camps. Then consider U.S. senator and 2016 presidential candidate Lindsey Graham – who said he’d consider using military force on the U.S. Congress if it didn’t fund the Department of Defense to his liking. Where are the charges against these traitors? And which federal judge is ordering them to be subjected to mental evaluations? Let’s compare D’Souza’s “crime” to the conduct of former U.S. senator and Democratic vice presidential nominee John Edwards, who was indicted for allegedly funneling $1 million in campaign contributions to his mistress, Rielle Hunter. Edwards’s campaign finance scandal took place as he was running for president – and as he was conspiring to place the blame for his and Hunter’s love child on one of his staffers. Finally, the scandal took place as his wife was dying of cancer. Edwards got off scot-free. Not one of the charges against him stuck. And no one accused him of being crazy. D’Souza? He was sentenced to eight months in a halfway house and five years’ probation and ordered to pay $30,000 in fines. He was also required to undergo eight months of court-mandated “therapeutic counseling” by liberal U.S. district court judge Richard Berman – best known for his 2008 ruling forcing U.S. taxpayers to subsidize “halal” meals for Islamic criminals. Yet to hear the vast left-wing conspirators tell it, D’Souza is the crazy one. Speaking of crazy, consider how the vast left-wing conspiracy treated the “gender evolution” of the athlete formerly known as Bruce Jenner. Obviously American citizens – as their means permit – are free to pursue their idealized selves. That’s what individual liberty and market freedom are all about. Jenner is free to call himself Caitlyn – and pay for multiple procedures to surgically transform himself from a man into a woman. No one’s stopping him – or her – from doing that. In fact, no one did. Nor did any credible voice at any stage of the process argue that Jenner didn’t have the right to undergo such a transformation. But acceptance wasn’t the left’s objective – force-fed tolerance was. It wasn’t enough for those of us who disagreed with (or were repulsed by) Jenner’s transformation to hold our tongues. According to the vast left-wing conspirators, we had to affirmatively applaud it. For future Hall of Fame quarterback Brett Favre, even that wasn’t enough. Last month, The New York Post rebuked Favre for failing to clap with sufficient enthusiasm as Jenner took the stage at the 2015 ESPY Awards. Make no mistake: this is where America is headed. Consider what’s happening in Chappaqua, New York – hometown of presumed 2016 Democratic presidential nominee Hillary Clinton. As part of its Orwellian “neighborhood engineering” efforts, the administration of Barack Obama wants to force this Empire State hamlet to nullify its zoning ordinances to erect a low-income housing development. Replete with racist assumptions of inferiority and intolerance, Obama’s compulsory integration permits government meddling in one of our most basic freedoms – where we choose to live. Everywhere we turn, American freedoms and free markets are under attack – from Obamacare’s insidious individual mandate to the IRS persecution of conservative groups to the NSA’s warrantless mass surveillance of all Americans. All the while, the national debt is soaring, our entitlements are on the verge of being exhausted, labor participation is at four-decade lows, wages are stagnant, and America’s status as the world’s only superpower is crumbling every bit as fast as the rule of law is eroding here at home. The author is the former president and a current board member of Americans for Limited Government. 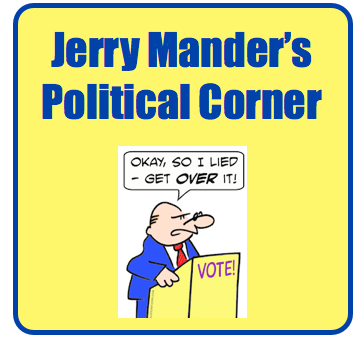 Jerry Mander’s Political Corner – What Difference Does It Make? I like D’Souza, we need more men like him! Mentally unbalanced. CRAP! The article is spot on. However, I have a unique perspective. My father was born in a Soviet labor camp, in Tomsk Siberia. His family perished in horrific ways during the Stalin purges. The ability for the average American to comprehend the insidious nature, and brutality of this ideology is nill. By the time they can understand, it will be too late.